Furniture design for tweens and teens has evolved in 2018. For those parents looking to upgrade their bustling young one’s space, the Evolve Collection from VOX brings you all you need and so much more. 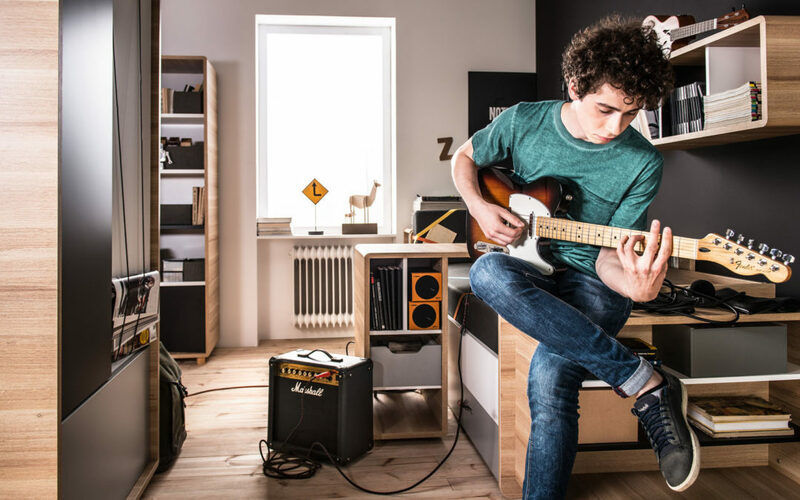 With VOX priding itself on getting young designers on board to bring out award-winning furniture design, Young VOX and the Evolve Collection celebrates youth and the individuality of tweens and teens today. Read how the Evolve Collection incorporates clever furniture design to make life simpler for you as a parent and your child’s space a celebration of their individuality. Individuality, creativity, and innovation is the essence behind the furniture design ethos of the Evolve Collection. The Evolve Collection is set to bring out your child’s full creative potential. How so? Well, looking at each furniture item individually will not only showcase how this will bring out their creative potential, but also show how the collections unique design is both practical, and the logical choice for tweens and teens bedrooms today. What Makes The Evolve Collection Special? To answer this, we need to think about what is it that is important to tweens, teens and parents alike? How about rounded corners to prevent injury and offer a seamless sturdy design? Evolve has that. What about space to display photos creatively? Well, what if we told you that there are elastic cords that form part of the wardrobe design to display photos. How about ease of use? Evolve has got you covered with a push opening system on the doors. With this in mind, you can see the Evolve Collection has been designed with youthful excitement. The Evolve Collection – Fit for teens and tweens alike. Imagine a bed that doubles up as a storage unit. A bed that not only gives your child the comfort that is needed for growth, but offers a space saving solution. The unique Evolve Couch Bed is truly a furniture design piece worth talking about. With two raised sides mimicking a daybed and a couch-like removable headrest, the Evolve Couch Bed gives your tween and teen a sense of secure comfort when sleeping or just chilling in their room. Below the main mattress lives a built-in lifter frame on the bed’s base to allow for extra storage. Here they can store sporting gear, games, you name it. What makes this bed even more special is the add-ons that form part of the Evolve kids bedroom unit. We’ll have a look at these items more closely below. The Evolve Couch Bed with functional storage unit built in. Additional Sleeping Space And/Or Additional Storage? As part of the Evolve kids bedroom unit, the Evolve Couch Bed gives you the option to add more storage below the bed or an additional sleeping space for those all-important sleepovers. The Evolve Underbed has been designed to fit perfectly underneath the Evolve Couch Bed. Therefore, sleepovers are a breeze. The Evolve Underbed slides out easily for when friends come over and fit an extra-length mattress for added comfort. 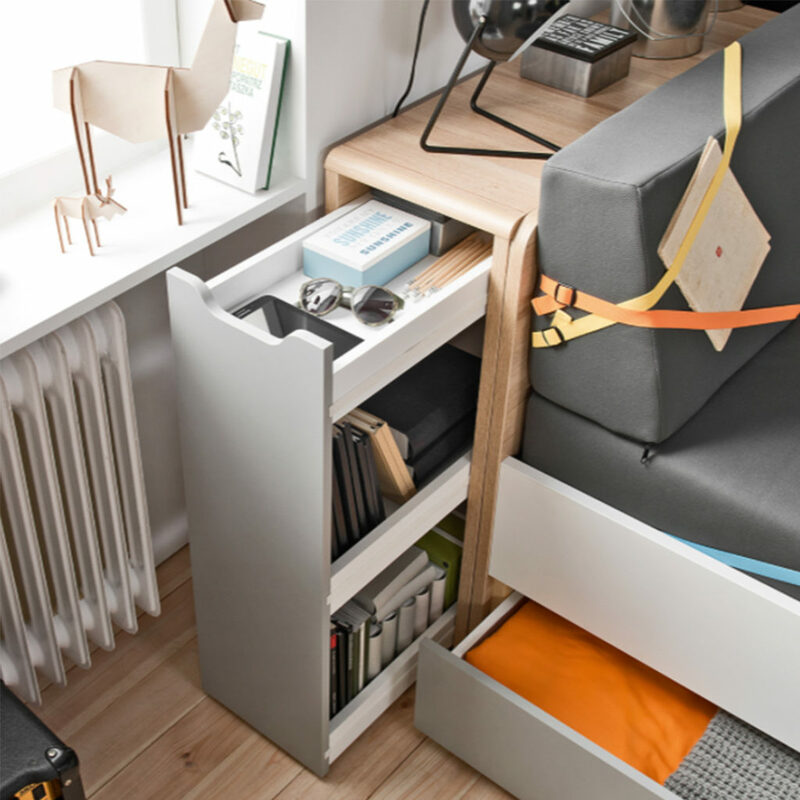 Alternatively, if extra storage space is needed, the Evolve Storage Drawer offers space for storage of larger items. But don’t fear, if you want the additional sleeping space but you are in need of more storage right by their bedside – the Evolve Bed Cabinet has been designed to fit perfectly behind the bed’s headrest and offers ample storage whilst doubling up as a nightstand. Notice the Evolve Storage Drawer and the Evolve Bed Cabinet as part of the Evolve kids bedroom unit. 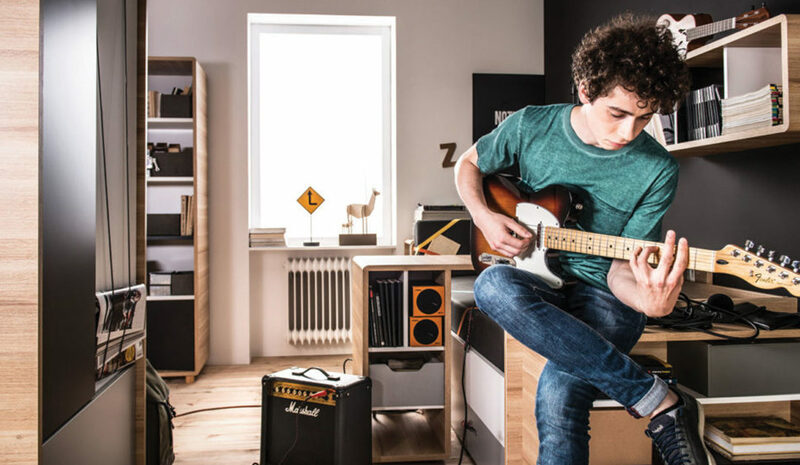 With school projects and exams playing a big part in your tween and teens life, a workable desk and shelving space are essential. Therefore, the Evolve Collection follows suit. With easy mobility, the Evolve Sliding Desk offers clever functionality in your child’s bedroom. Your kids can use the desk on the one side with a comfortable chair for projects and study time. The Evolve Sliding Desk has a storage drawer built in with push opening system, making it safe for kids and easy to use. And when it’s time to relax, the desk slides easily over any single bed for night time streaming right on their laptop. What about shelving for books? The Evolve Hanging Wall Shelf and the Evolve Narrow Bookcase offers ample space to store books and keepsakes. Everything they need will be in arms-reach. The Evolve Sliding Desk slides easily over the Evolve Couch Bed. Now we come to a space to store clothes and shoes. The Evolve Wardrobe with Drawer offers ample space to hang clothes with a rail on the right and shelves on the left. Furthermore, below the hanging and shelving space is a drawer where shoes and chunkier items can easily be stored. With the innovative elastic straps on the white side of the wardrobe giving your teen the opportunity to get creative with showcasing their favourite photos and memorabilia. This contemporary design rounds out the look of the room and will help your kids keep things well organised. The Evolve Wardrobe with Drawer with its contemporary design will help pull the look together whilst keeping things organised. What do you think of the Evolve Collection? Let us know by commenting below. Be sure to like us on Facebook and follow us on Instagram @VoxFurnitureSA to get inspired.